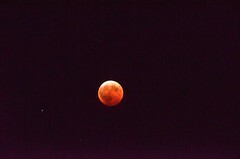 It was an unusually clear night for viewing the lunar eclipse in Bethel. This is my first attempt at night time photography. The wind was jiggling my flimsy tripod and my fingers were so cold I went inside to warm up three times. But it was well worth the view. There are few more pictures on my flickr site too.